G.V.PRAKASH GIVES CHANCE TO THE CURRENT SOCIAL MEDIA SENSATION! A singing video of a visually challenged girl, Jyothi, grew instantly viral in social media, with praises coming for that girl's unique voice from various quarters. 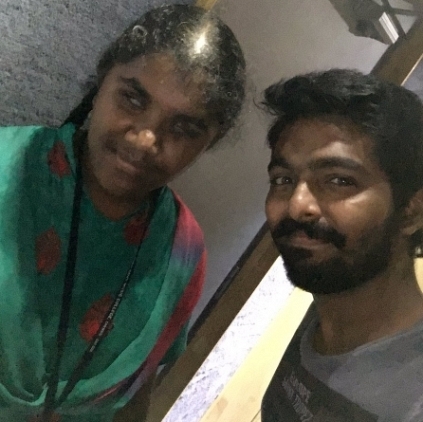 G.V.Prakash Kumar, who has also apparently seen the video, with the help of few of his friends, has got in touch with the girl and has made her sing in his next film Adangathey. He took to Twitter to share this happy information, "Yes this wonderful singing talent Jyothi will be making her debut in my next musical album #adangathey. god bless"
A very humanely gesture by G.V.Prakash! Exclusive : Vishnu Vishal turns assistant director! 90's blockbuster track 'Tu Cheez Badi Hai Mast' to be recreated! People looking for online information on Adangathey, G.V. Prakash Kumar will find this news story useful.